Today we took our usual Saturday long walk, but it was SO cold out we needed to warm up when we came home. 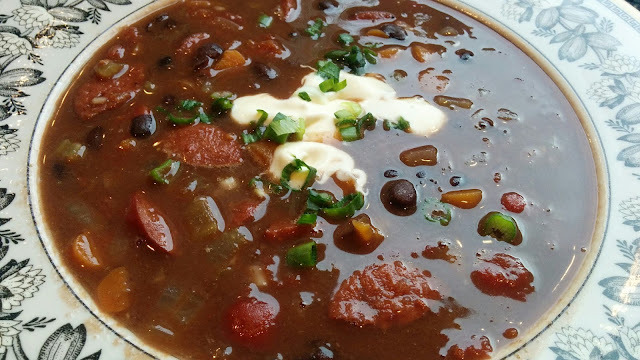 Since I still had a lot of hot links in the freezer due to the last Costco run, I decided to make a black bean and hot link soup. 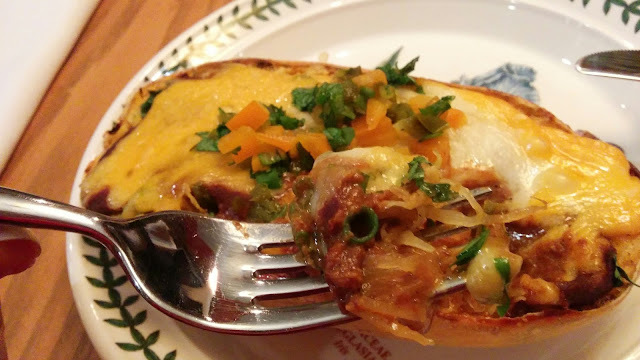 This one is hearty, spicy, somewhat healthy and will warm you up. This soup started from a very spicy vegetable stock that I made last week (don't worry you can use canned stock). Often times I will simmer lots of veggies trimmings and make stock, this day I added the cores of the jalapenos... so essentially the seeds. After about 10 minutes of simmering, I tasted the stock and almost blew the top of my head off! Immediately, I fished the two jalapeno "cores" out of the stock, hoping it would not get any hotter. I was left with stock that I couldn't use for my mushroom soup, so I put it in the fridge to consider what to make. It was perfect for this one, so I didn't add the jalapeno that I included below. You could serve this with a little creme fraiche (or sour cream) and some cornbread on the side! I have two favorite cornbread recipes, Sweet & Spicy Cornbread or Good Ole Basic Cornbread. 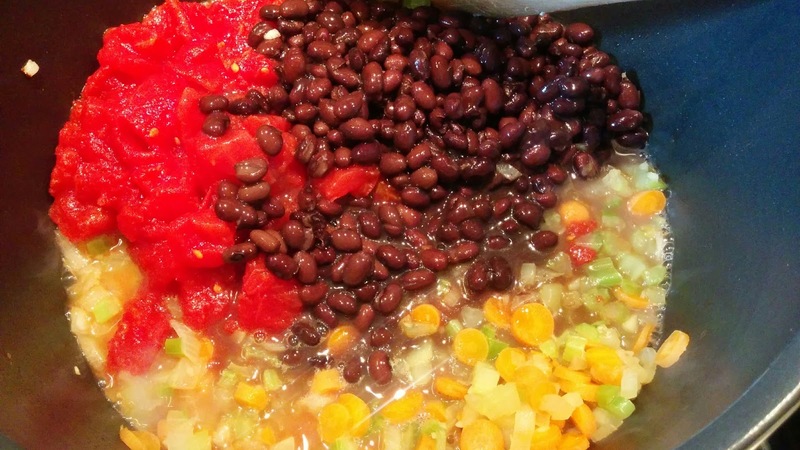 I love to make a batch of soup on the weekends and save some for the week's lunches. 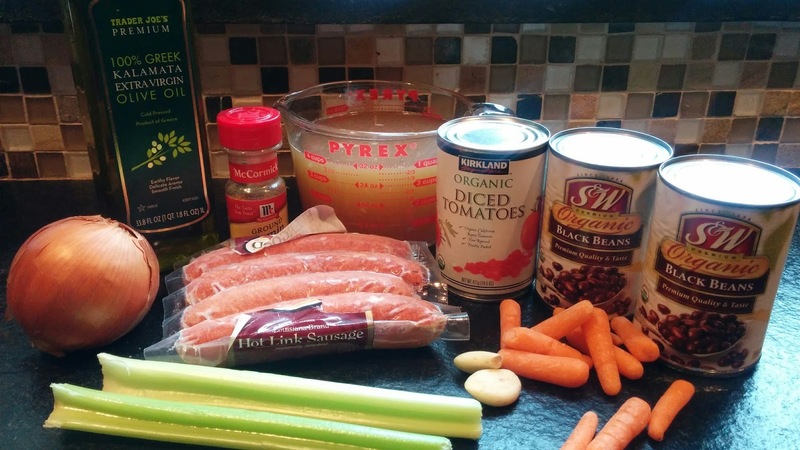 This soup was finished in just about 35 minutes, but would be good to do in a crockpot and simmer on low for the day. Saute the onions, celery, carrots and garlic in the olive oil for about 3-4 minutes over medium high heat. Add the black beans, tomatoes, spices, hot link and beef stock. Simmer over medium heat for 25-30 minutes. If you want some thickness to the soup, smash some of the beans with a tomato masher. Here it is just before I added the stock and let it simmer for about 30 minutes. So I could think recipe in Cooking Light...but I had a hard time really believing it is "light". However, these are very, very good and satisfying. I did get lots of laughs at work when I mentioned they were "light" from Cooking Light magazine. 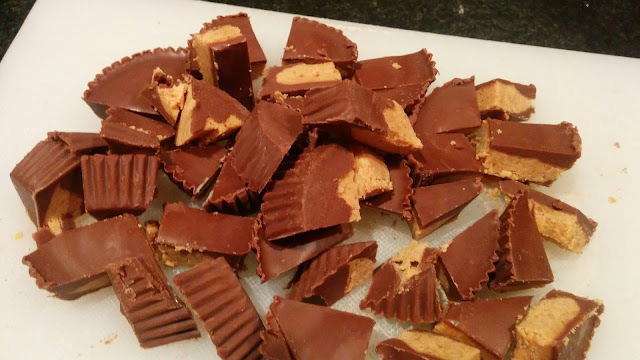 In full disclosure, I did add more Reese's peanut butter cups than the original recipe called for (6 instead of 4) and I did add 1/4 cup of peanut butter chips, as I had them on hand. Clearly I am responsible for these not being "light". AS you can see, I did not take a picture of my ingredients. The silly part? I set up all the ingredients and even framed it with my camera, however I must not have hit the button as I have ZERO photos of the ingredients set up on my phone. Clearly, I am the silly one. 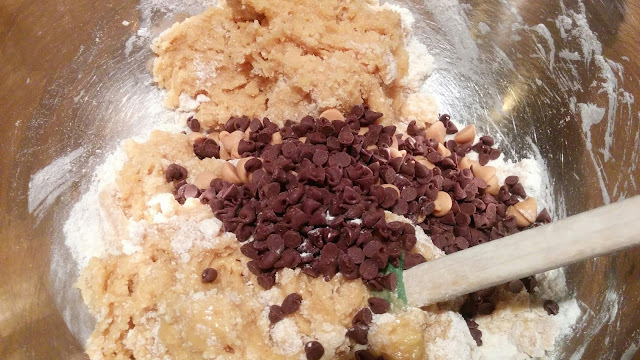 Combine flour and next 3 ingredients, stirring well with a whisk. 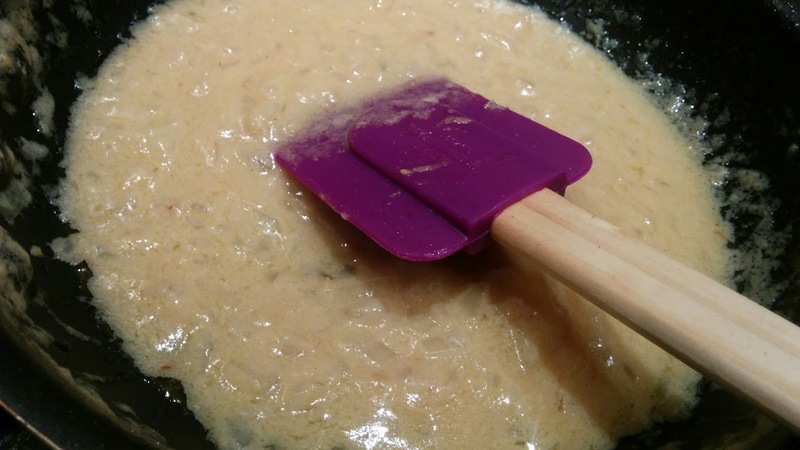 Combine peanut butter and next 4 ingredients (through eggs), stirring well. 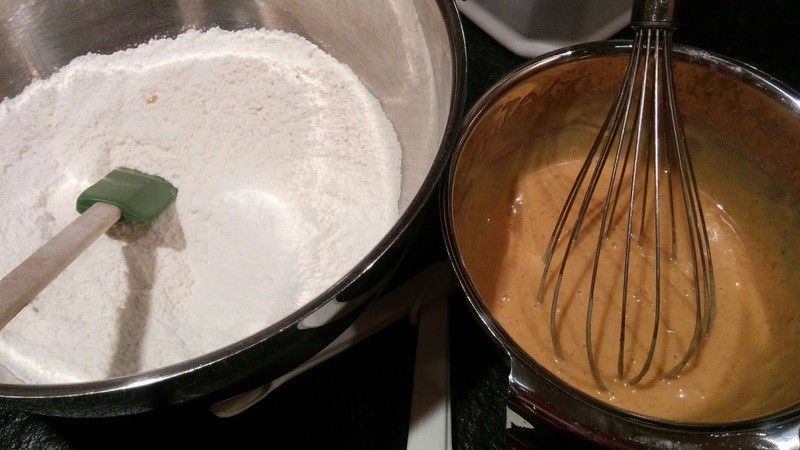 Add peanut butter mixture to flour mixture; stir until combined. 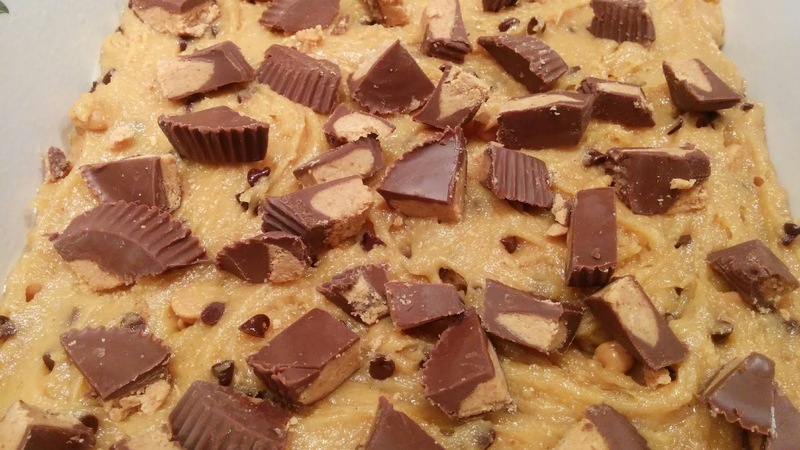 Stir in chocolate and peanut butter chips. 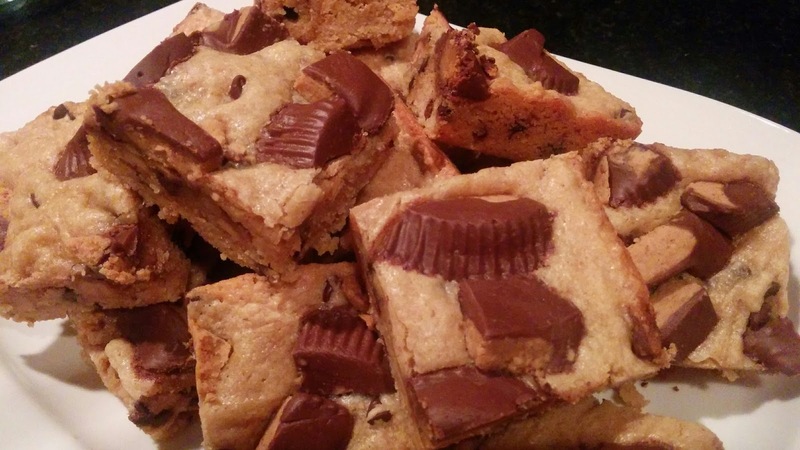 Scrape the batter into a 9-inch square metal baking pan lightly coated with cooking spray, and arrange the peanut butter cups over batter. Bake at 350° for 20-23 minutes or until a wooden pick inserted in center comes out with moist crumbs clinging. Cool in pan on a wire rack. Best to let it cool completely before cutting. The original recipe called for 4 individual pieces, or 2 packs. Ummm, I used 6 snack size individual ones. Some of you are so disgusted by this thought. But then again, you are reading this, so let me tell you why I like this as I know there are lots of haters out there. Everyone knows roasting is the best way to eat lots of different veggies, and if you don't I'd suggest you fire up the oven and have a go at it!!! I happen to like cabbage but if you don't normally like it, this may do the trick. 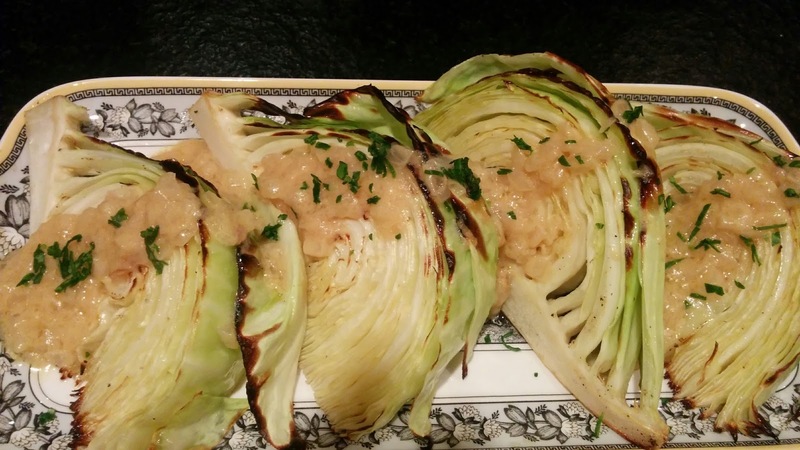 The cabbage is sweet, with crispy edges and some softness and crunch both. Having a nice little horseradish and djion sauce on the side really rounds it out. We ate this last night with steaks and a nice bottle of wine. I liked it so much I had the leftovers for brunch with two fried eggs. I mean, why not? I'm thinking this idea would be good for a soup too, but I need to keep thinking of that. 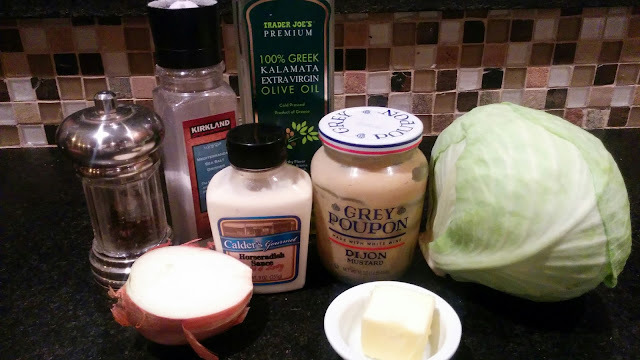 I DO have a 1/2 a cabbage in there, so I am going to have to do it soon. Got it... cook it. NOTE- Preheat the oven to about 450 before you do anything! Make sure your oven is good and hot, preheat it to 450. I add my baking sheet so it's hot too. Then add the pre-done cabbage... but wait, I'm getting ahead of myself. 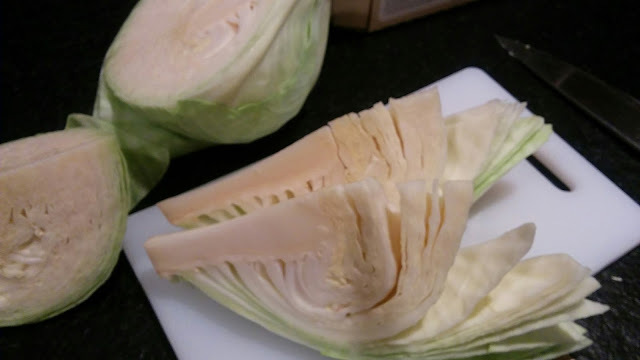 Cut the cabbage into 4 equal wedges. Cut all the way through the core, this helps to keep the wedge intact. Drizzle (or brush) olive oil on each wedge, add salt and pepper. Add to the hot pan and set the timer for 10 minutes. 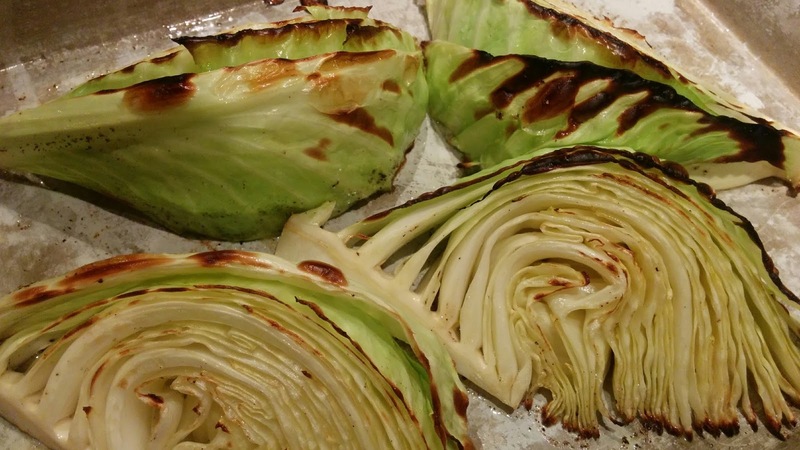 You will flip the wedges after 10 minutes, and then continue roasting for another 10 minutes. After the cabbage had roasted for a total of 20 minutes, I fired up the broiler and gave it another 3-5 minutes under the broiler. 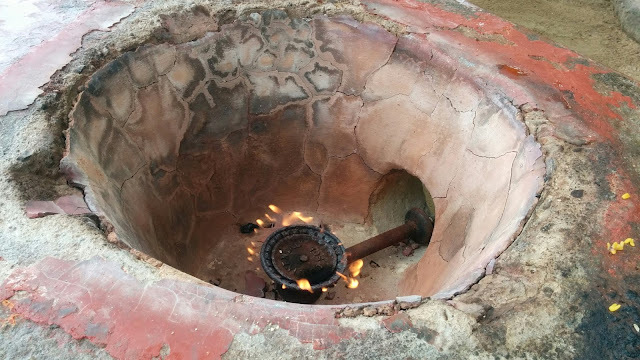 Watch it, don't let it burn. I like the look of the charred bits. Serve at once, pouring the sauce over the wedges and enjoy! Italy is on my mind. Just booked a trip later this year to Venice and I can't stop thinking about it. So, last night, we headed out to a new local Italian place, Amaro. We had a nice cocktail to start, I had the Americano (Campari, Sweet Vermouth and soda), and my hubby had the Amaro Negroni. Both were great, but we both liked his better. So today was the day to recreate this cocktail at home. 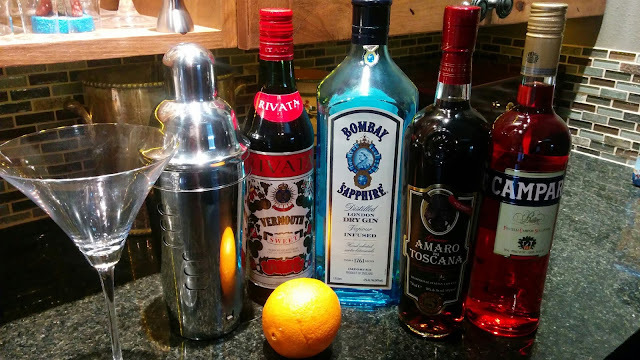 Now a traditional Negroni is equal parts gin, Campari and sweet vermouth. This one had Amaro in it. Amaro is a sweet and bitter herbal Italian Liqueur and quite delicious. Now one thing the drink menu didn't tell me is if the Amaro was used in place of the Campari, so obviously a little taste testing was in order. 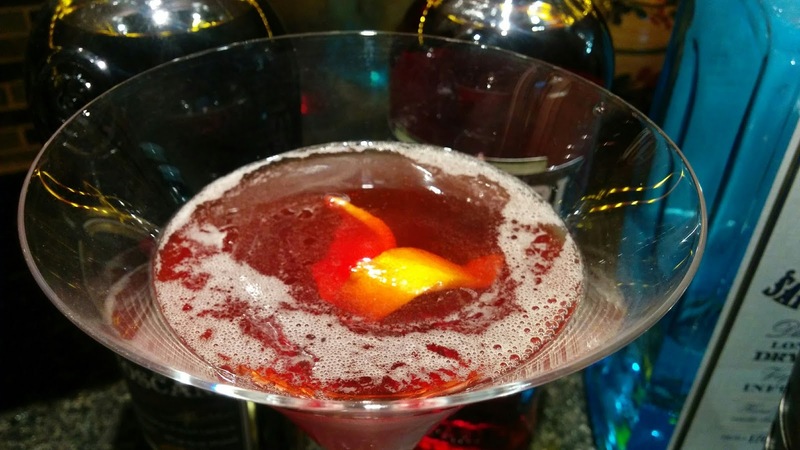 After much discussion and sip, sip, sipping, here's the recipe we liked best. Pour the gin, Amaro, Campari and sweet vermouth over ice in a cocktail shaker. Shake, shake, shake and then strain into a chilled martini glass. Twist the orange peel, releasing the oils, and then add the peel to the drink. Serve and dream of cozy Fall nights in Venice. Yep, one of those silly little "recipes" where the video shows some hands throwing things together in like, 30 seconds, or something. I must say I like those silly little videos. Usually they have some great ideas, and simple inspiration. Well, it worked on me. I saw this one and wanted to try it. 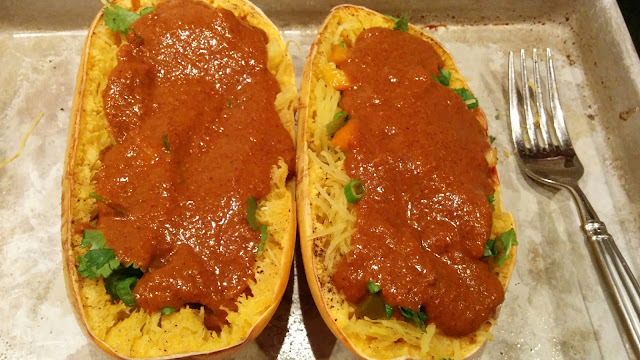 Though, I struggled calling this Enchilada Squash Boats... sounds awful, doesn't it? We loved this. It was kind of liked Mexican baked spaghetti, very satisfying and good for you. No one at my house even mentioned that there was no meat in it.... success for a meatless meal. 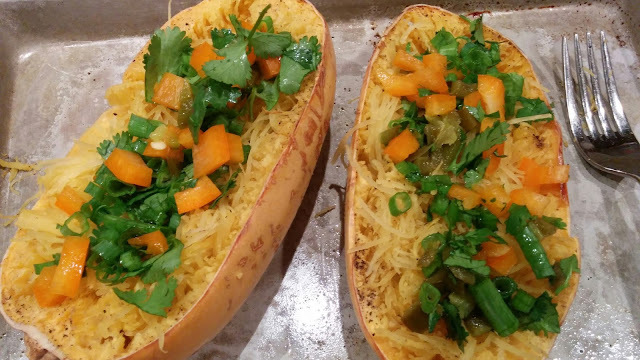 Bake a small spaghetti squash in a 400 degree oven for about 40 minutes. 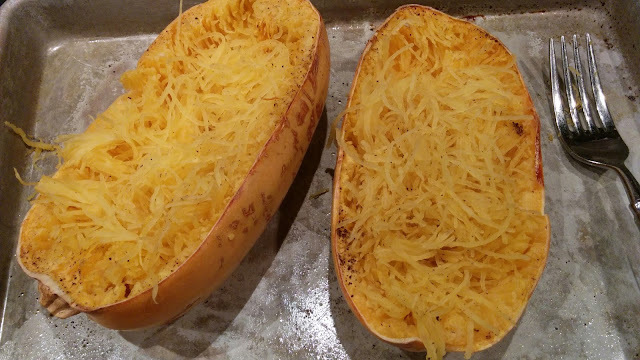 Using a pot holder, take a fork and shred each side, leaving it in the shell. It should shred easily. 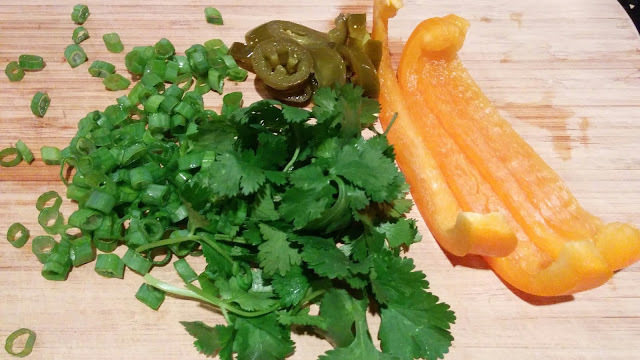 Here's what I used in mine, green onions, cilantro, pickled jalapenos and orange bell pepper. I chopped it all up and added about half to the "boats" and reserved the rest for topping the dish before serving. I just layered it on top, but you could also mix it in. 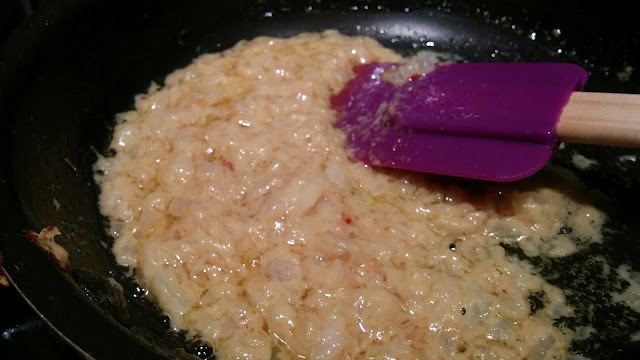 Add the enchilada sauce, I like a lot, so I used about 1/4 cup per shell. 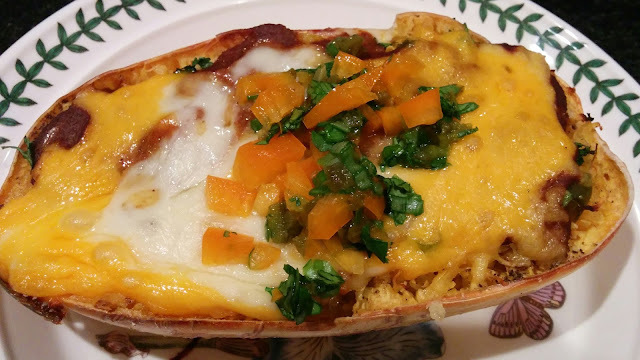 I had preheated the enchilada sauce just to reduce the amount of time to finish it in the oven and melt the cheese. However, I don't think it really makes that much difference, you could use it right out of the can too. 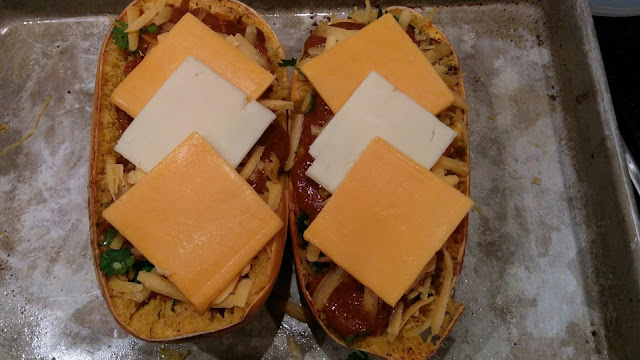 Add cheese... I had both some grated and some slices, so I used both. Add back to the 400 degree oven and bake until the cheese is melted and getting bubbly around the edges. Top with some more of cilantro, green onions, whatever you like. Avocado and sour cream would be nice too. It was a grey day, and kind of cold (under 80F) for Mexican cruising standards, but off the four of us went for our excursion adventure from Puerto Vallarta at 8am! Hard to get excited for the beach at 8am, don't you think? About an hour long boat ride from the port to Las Caletas, and it was a good trip, but we'd chosen some great seats on the top deck at the front to enjoy the view and therefore, we were last off the boat. Dang it, I think we misplayed that. 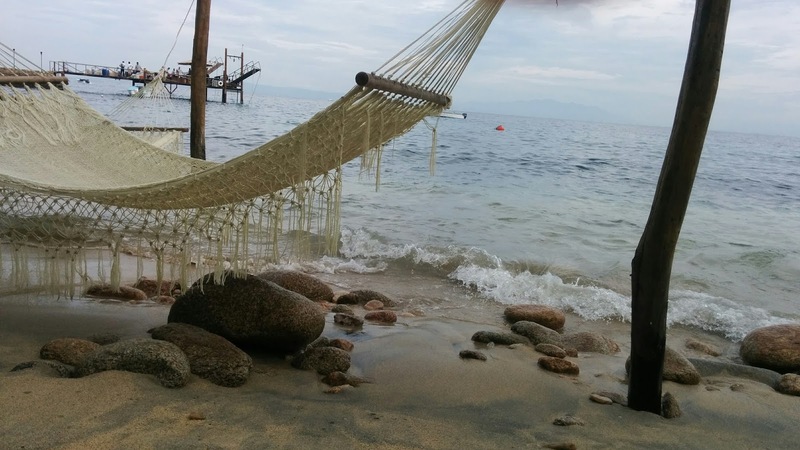 Now all the primo beach chaise lounge chairs were going to be taken! Imagine our surprise to come across these beauties, completely empty. 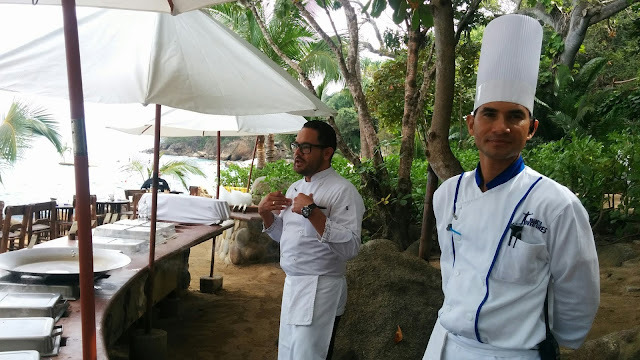 I was excited for the Paella Cooking class to start at 11:45 in a beautiful beachside cooking and dining area. I was scoping out the area in advance (see the pretty little seaside spot above) and caught a picture of a batch the chef was making for our lunch, before our class began. Yum... my picture isn't great because it was so steamy. It didn't seem polite to lean done and blow on it, which is what I usually do for hot dishes that I need to photograph. 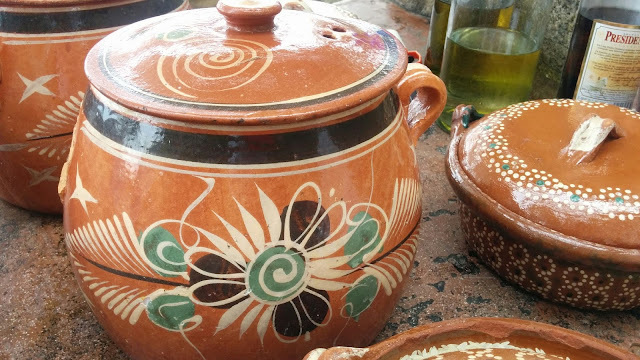 Beautiful pottery crocks containing the broth ready to make our paella. 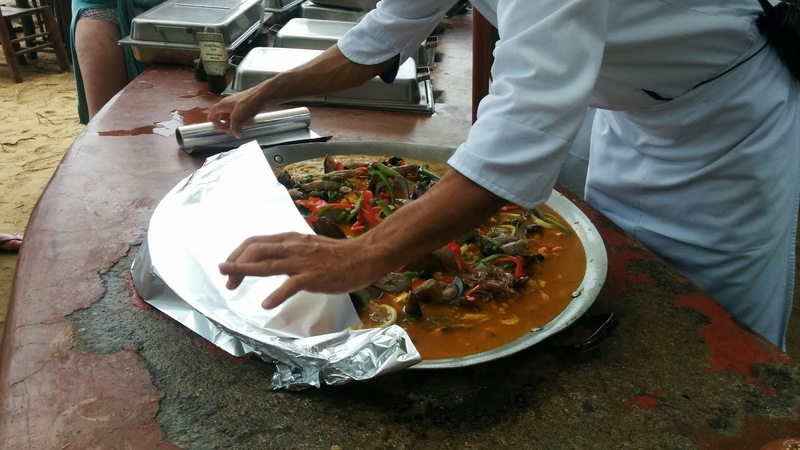 A picture of the paella cook unit built into the countertop. Rustic, but I like it! Here some the chefs to give our lesson. One guy was the talker, the other, the cooker! 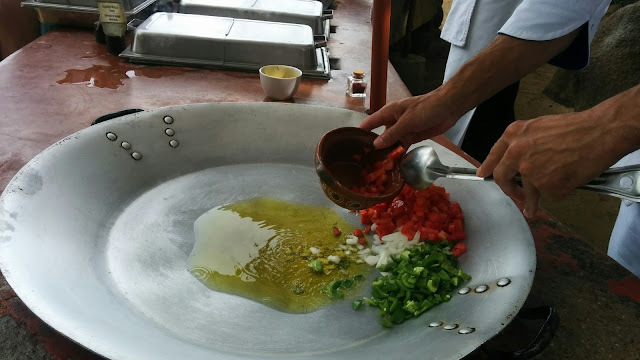 Heat up the pan, add Spanish olive oil, red peppers, green peppers and white onion. Normally, I do not like cooked green peppers but these didn't bother me. I almost wonder if these were jalapenos??? In goes the saffron and broth, a bunch of Spanish rice and then onto the seafood part. 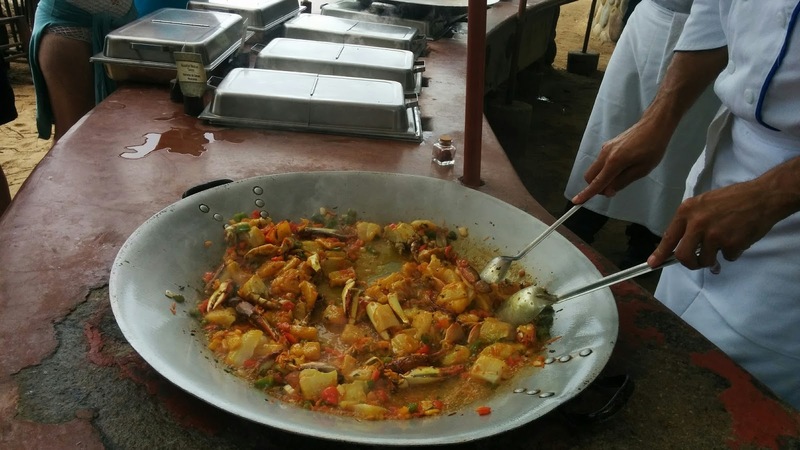 He added crab, fish, shrimp, octopus, calamari, clams, mussels and then MORE shrimp! 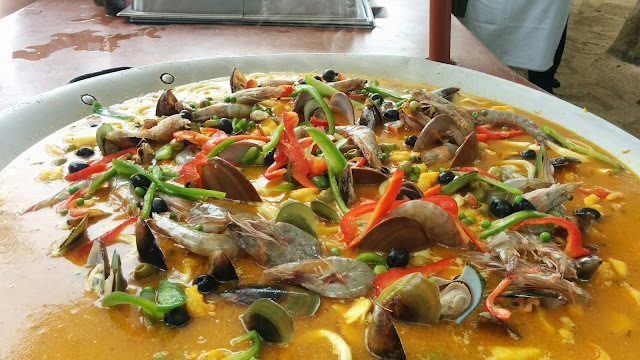 Artfully arranged and ready to cover and steam the rice and seafood. Covering the pan with foil. 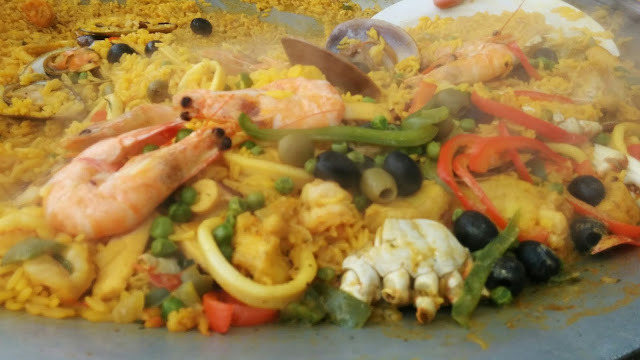 From the paella kitchen, we walked up a small inclined path to another open air area. 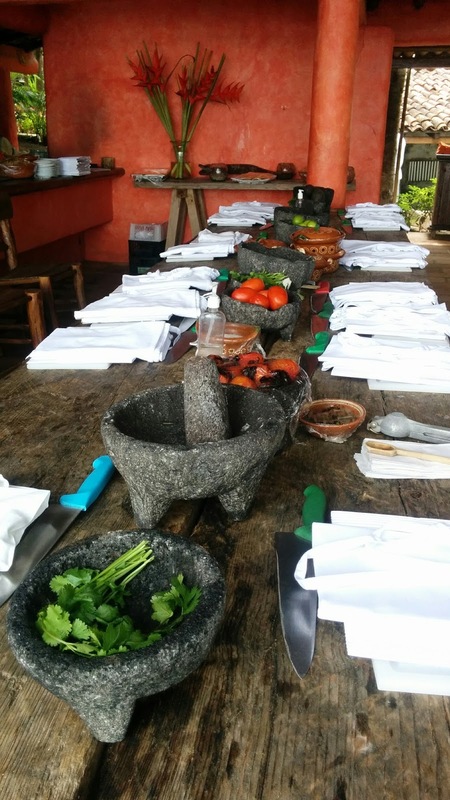 This was was beautiful inside and set up with four stations to do some hands-on cooking of pico de gallo, roasted salsa, seviche and guacamole. To the best of my ability to remember the recipe, here is my best approximation (I was drinking fresh mango margaritas!). I will make this soon at home, and if needed, will make some adjustments. Mix. Let sit in the fridge until the fish has turned opaque and has been "cooked" by the acid in the lime. ***At Las Caletas, for health department reasons, they could not use raw fish and had gently poached the fish that we used in the seviche. I expected it to be hard and rubbery, but it was tender and delicious. If using raw fish makes your squeamish, go ahead and gently poach the fish in some broth. 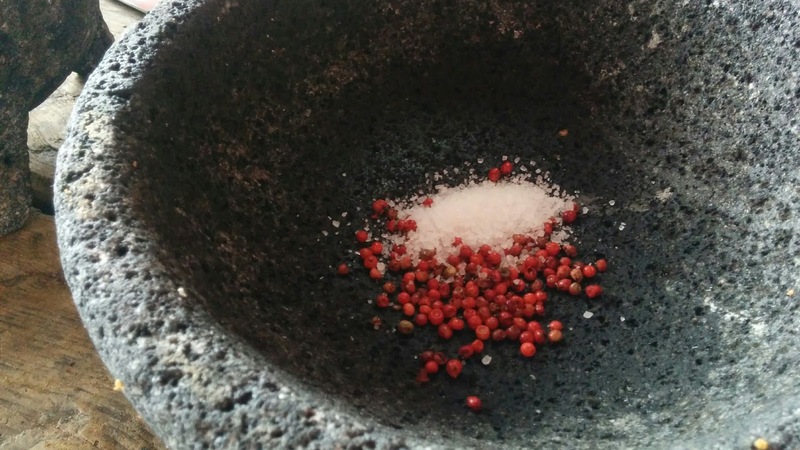 Here's the sea salt and the pink peppercorns before we smashed them in the molcajete, basically a mortar and pestle carved from volcanic rock. 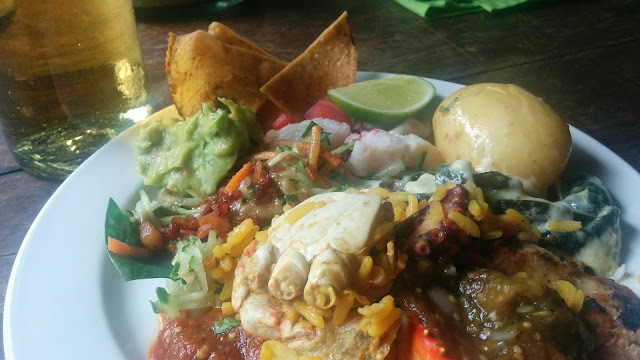 Here's a photo of our lunch... there was a tremendous variety of dishes to try. This was one of the best meals of our entire cruise. 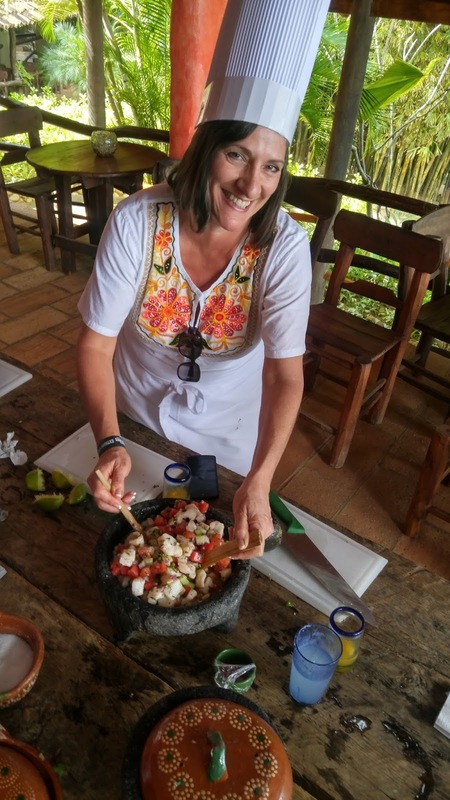 Plus, The waiters were always quick at your elbow to ensure you didn't need another beer or margarita! You know what comes after eating a meal like that don't you? 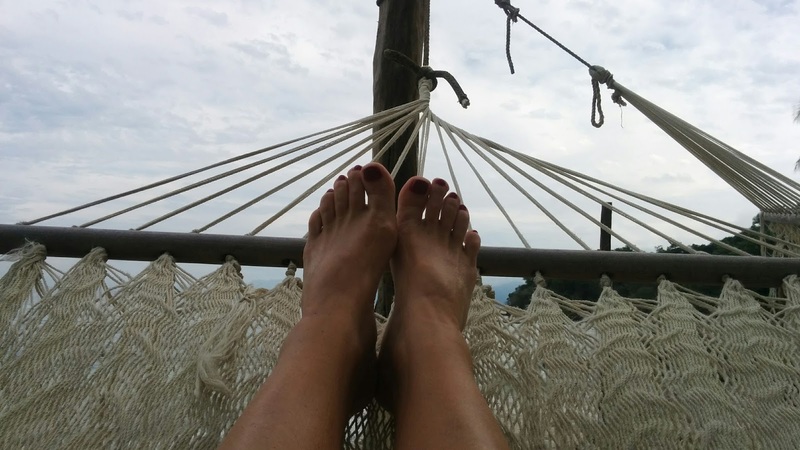 We had such a great time here, I would whole heartedly recommend it. There is so much more to do there than I have written about here. Like the parrots and the monkeys! Sure, I bet you are more adventuresome! 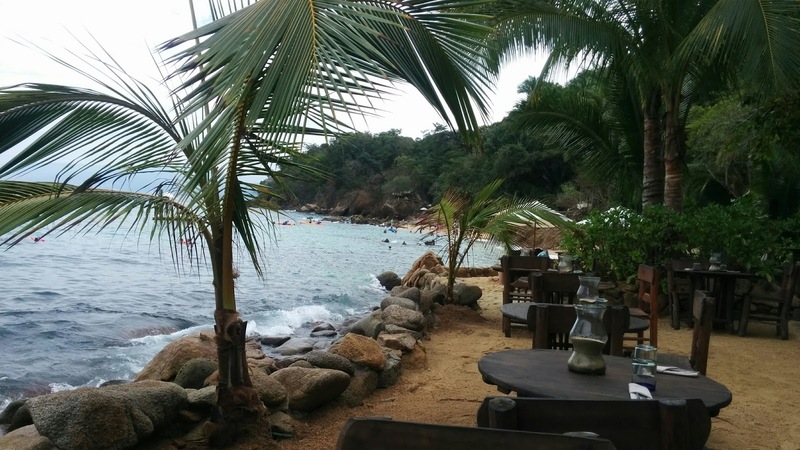 What about scuba, snorkel, stand up paddle boards, kayaks, sea lion interaction, nature trails and a spa! I am seriously wanting to go back to enjoy more of it there. I hear they do a night time romantic dinner there too. Sigh. NOTE- I did not receive any compensation (besides a damn good time) from Las Caletas, I chose to write and share about our day on my own free will!